MSI this week announced plans to bundle Intel Optane Memory 16 GB caching drives with select Intel 200-series chipset motherboards. The company claims that the drives will not increase prices of motherboards significantly, but will bring tangible performance benefits when it comes to boot times and application launches versus systems employing HDDs. 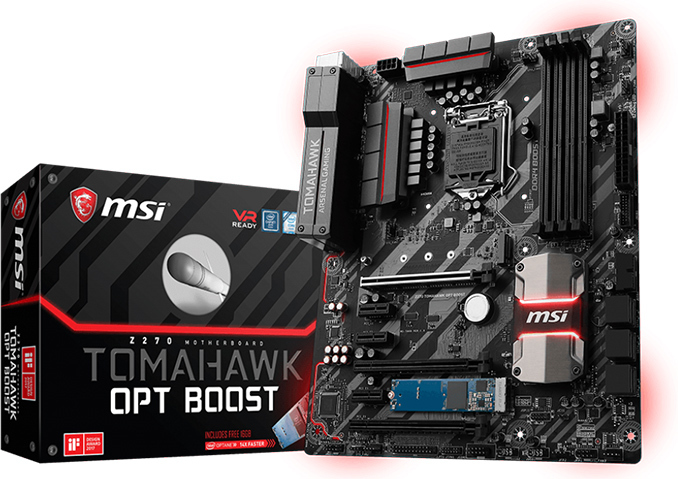 MSI will add Intel’s Optane Memory 16 GB drives to its Z270 Tomahawk Opt Boost, B250M Bazooka Opt Boost, as well as B250M Pro Opt boost motherboards, which means the company will be hitting gaming, mainstream, and commercial PCs. The consumer Intel Optane Memory caching drives were not designed to replace conventional SSDs, but were developed to enable hybrid storage solutions featuring fast solid-state memory as well as a slower storage device with SATA interface (i.e., an HDD, but SSHDs and even SATA SSDs are formally supported as well). The Intel Optane Memory 16 and 32 GB drives cache frequently used data (i.e., frequently used LBA sectors where Windows boot files and frequently launched applications reside) with the help of Intel’s software and PCH and therefore speed up PCs with mechanical hard drives. Performance-wise, Intel’s Optane Memory 16 GB drive offers up to 900 MB/s sequential read and up to 145 MB/s sequential write speed, but keeping in mind that the drive is used for caching, random read speeds and overall read latency are what matter most. While MSI bundles the Optane Memory 16 GB drives with select 200-series motherboards, it should be noted that the drives are only supported by Intel’s Core i-series Kaby Lake processors (so, no Celeron or Pentium) and Microsoft Windows 10 64-bit OS. In addition, the Optane Memory drive must be supported by the UEFI firmware of the motherboard. Based on our own test results, Intel’s Optane Memory 32 GB caching drive can bring performance an HDD-based system up to the level of mainstream SSDs in SYSmark, but like most hybrid storage sub-systems, this happens only with frequently used files or programs. The good news is that Intel’s Optane 16 GB SSD (retail $47) comes for free(ish) with select MSI’s motherboards, essentially bringing an inexpensive performance improvement to equally inexpensive systems with HDDs. Why can't this be dropped into pcie on an amd board? It's talking nvme. ... except that it is an SSD with no Windows SSD-style driver. Without a driver, it basically becomes useless. 1) Use it as a RAID drive. Install this in any board with an m.2 slot, put the mobo in RAID mode, and magically you get an SSD because Windows will use the RAID driver rather than a device-specific driver. Still no caching capabilities because that is something special on Intel CPUs and chipsets, but you can at least get a small drive. PC Perspective did a RAID1 across 3 of those drives and got stupidly fast results... for a stupidly high price... but it is an option. 2) Go the non-Windows route. My understanding is that there are NVME SSD drivers for this drive under Linux, BSD, Unix, etc. So if you install this on an AMD board and run linux then you are good to use it as a SSD... but again, no caching, because the software that interacts with the CPU and chipset are (at least for now) a windows-only affair. To begin when, I was speaking from a Linux perspective, since that's what I'm most familiar with, but the others should have similar features even if it's not PnP (as they said, Windows has its own -not very good, but replaceable- nvme driver). I understand what you're saying, and I considered the possible duties the fw may have, but came to the conclusion that the os should be able to handle it. You don't need raid, and it wouldn't map to any of the conventional levels anyway. That's why i went straight to the block layer. You can set it, on Linux, to act as your fs cache with bcache, lvm (dm-cache) or flashcache/enhanceio, then set your policies. Yes, the fw can do this for you since this looks REALLY similar to srt, but that's windows only. Using these types of stacking methods doesn't require support from the pch. Waste of money when the Logical Volume Manager or/and Filesystem are not able to control the cache directly. It will be frustrating because of the random performance changes as data gets moved in and out of cache. Haven't used a photoshop for a week but installed some games and copied some data in? Chances are photoshop isn't in the cache anymore and will open slowly. I agree , a good modern SATA SSD is as fast as i can take , when i boot it takes under 5 seconds , when i click something it comes up instantly . When using PrimoCache i get 10k read and write caching performance.